12 December 2001. 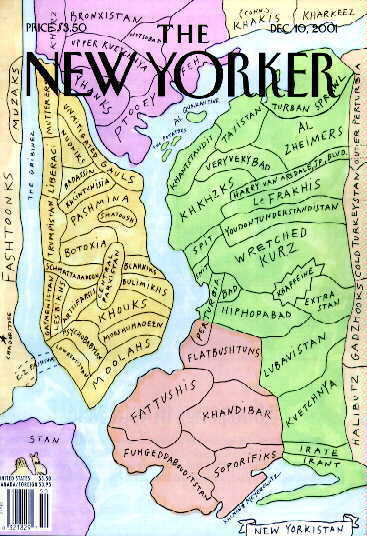 Thanks to L.
A quarter century ago, on March 29, 1976, a simple, pastel map of New York City appeared on the cover of The New Yorker. Drawn from the perspective of a low-flying bird looking west from Ninth Avenue, you could see the world receding from the city: the Hudson River, New Jersey, Kansas City, then the Pacific Ocean and Japan. It was Saul Steinberg's famous "View of the World from Ninth Avenue," a drawing reproduced and imitated countless times. Every city wanted a version of its own. Steinberg once said that if he had gotten the proper royalties, "I could have retired on this painting." This week, another simple pastel map, a flat, bird's-eye view of New York City drawn in pen and wash, appeared on the cover of The New Yorker. It showed the names of the city's neighborhoods Afghanistanicized: Lubavistan, Kvetchnya, Irate, Irant, Mooshuhadeen, Schmattahadeen, Yhanks, Feh, Fattushis, Fuhgeddabouditstan, Hiphopabad, Bad, Veryverybad, E-Z Pashtuns (leading to New Jersey), Khakis and Kharkeez (in Connecticut) and, most touchingly, Lowrentistan, where the World Trade Center once stood. The map was made by Maira Kalman, who grew up somewhere near Upper Kvetchnya (she did the pen work) and Rick Meyerowitz, who is originally from around Ptooey (he did the watercolor). Both now live in Artsifarsis. When their cover came out, suddenly a dark cloud seemed to lift. New Yorkers were mad for the map. They laughed. They shared it. They recited their favorite joke names on the map, making sure you had the proper Yiddish: the name Gribinez (for the Hudson River) means cut-up chicken parts. They checked out your cultural knowledge: Blahniks (the Upper East Side) is where everyone can afford Manolo Blahnik shoes. What? You don't understand. Youdontunderstandistan? You should be banished to Outer Perturbia (somewhere on Long Island). Perhaps not since Steinberg's drawing had New Yorkers pored over a magazine cover so long. Of course, the maps are totally different. Steinberg's is a delicate drawing done in perfect perspective, with fully realized cars and little witty dotted lines separating Canada from Chicago and Mexico from Washington. The drawing by Ms. Kalman and Mr. Meyerowitz is flat and na�ve. Aside from a funny perplexed camel standing in the middle of Stan (Staten Island), the humor is all verbal. So what, if anything, ties these covers together? Maybe the clue lies in the one true bit of real estate on the new map: Harry Van Arsdale Jr. Boulevard (O.K., so the real one is an avenue), which runs from Khkhzks in Queens to Outer Perturbia. What is this piece of reality doing in this Afghanistanicized city? And why, of all New Yorkers, should Van Arsdale have been designated for post-jihad attention? Van Arsdale (who died in 1986) was the president of the New York City Central Labor Council at its peak. His last big hurrah came in 1975, when he helped put together a plan to lift the city out of its fiscal crisis. That was the year of the famous Daily News headline "Ford to City: Drop Dead." It was also the year Steinberg drew his famous map. (It was published a year later.) So maybe here's the tie: both maps are pictures of New York City at its darkest hour with its back to the wall, digging in its heels. Actually, neither Ms. Kalman nor Mr. Meyerowitz knew precisely who Van Arsdale was. But Mr. Meyerowitz said, "The name never failed to make me laugh when I approached it." The whole map began in fun. "We were on our way to a party in Westchester County," she said. Driving through the Bronx, she suddenly called out: "Bronxistan." And the names started flowing: Le Frakhis (a pun on LeFrak City). Some places on the map have the ring of truth. Lubavistan is roughly where the Lubavitchers live. And parts of Fashtoonks (which derives from the Yiddish for "stink") really did stink once; there were pig farms in New Jersey. "The beauty part of New York," Ms. Kalman said, "is that it is a mishmash. Everybody is running around with a different costume and a different story." New York, like Afghanistan, is made up of tribes with a bunch of exotic names that mean nothing to outsiders. New York City should take second place to no one, as Mr. Meyerowitz said, not even Afghanistan. We are as tribal as anyone. Steinberg's map is tribal, too, but different. His New York is a self- absorbed city. It is us versus them. In the all-important city you can see that taxicabs, people, water towers and windows matter. And far, far away are all those places that don't really matter: the Midwest is yellow, and somewhere out there must be Afghanistan. You can't say those places don't matter to New Yorkers now. Kandahar, Kabul and Kunduz do indeed matter. So do all the -stans and all the -bads. The new map clearly shows that change. It looks like a map of the Middle East has been laid over the whole city. But if you look carefully at New Yorkistan, you'll see New York, resistant as ever. Seventh Avenue is still in Schmattahadeen (the rag district), and La Guardia Airport is still Taxistan. Staten Island will always be just plain vanilla, a place that deserves the name Stan, even if there is a camel standing in it. So the new map is like the old. It is still us against them that wants us dead. If the world gives you Kandahar and Chechnya, send them back Khandibar and Kvetchnya.